May is shaping up to be a wonderful month to study the night sky. 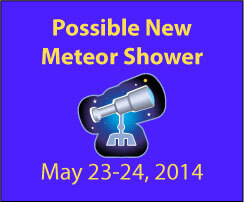 After the Eta Aquarid meteor shower at the first part of the month (debris from Halley's Comet, no less), we can now look forward to a never-before-seen shower on the night of May 23-May 24, 2014. Way back in the 1800s, a small comet named Comet 209P/LINEAR jettisoned some debris. The Earth will be passing through this debris field on Friday night, May 23 through the morning of Saturday May 24, 2014. Some scientists are predicting that the dust entering the atmosphere will create an amazing new meteor shower. Of course, because it is a brand new event, no one knows for sure what we'll be seeing. If it works out, the meteors are expected to come from the northern sky, appearing to arise in the constellation Camelopardalis or near the North Star. The shower is expected to peak around 2-4 a.m. Eastern Daylight Time (EDT). 1. Find a safe location with as few outdoor lights as possible. Remember, porch and street lights can fade out even the brightest meteors. 2. Remind your children there may be several minutes or more between sightings. In the wee hours of the morning it can be hard to be patient. Point out constellations and major stars to help pass the time and keep interest up. Just think, you will be seeing the bright lights in the sky that result from pieces of a comet left behind over 100 years ago. How cool is that? 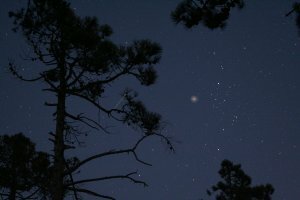 EarthSky has more about the meteor shower and viewing times. If learning about the meteor shower thrills your budding astronomers, we have two new books by Mary Kay Carson that might also interest them. Did you know one of the planets in the solar system has a storm cloud that has been named Scooter? Or that one planet used to be called George? Those are just some of the amazing facts the reader will find out about in How Many Planets Circle the Sun? : And Other Questions about Our Solar System (Good Question!) by Mary Kay Carson and illustrated by Ron Miller. The text is written in an engaging question-and-answer format so the reader can choose to read cover to cover, or jump in and pick out those questions that are most intriguing. For example, are you interested in learning more about comets and meteor showers? On page 27, Carson explains what comets and meteors are and how they are related. Some of Miller's colorful illustrations are so realistic, it seems like the reader could reach out and touch a planet. Why Does Earth Spin? : And Other Questions about Our Planet (Good Question!) also by Mary Kay Carson and illustrated by Peter Bull comes down to Earth to explain common questions children ask, such as why the sky is blue and why the moon is important to the Earth. A mixture of full-color photographs and artist's renditions help clarify details like the relative sizes of the Earth and other planets. This one would be perfect for a unit on Earth Science. Conclusion: The question-and-answer format works well in both these books. I will definitely be adding them to my list of space and astronomy books for children at Science Books for Kids. Please leave a comment if you see any meteors on May 23-24! Disclosures: These books were won in a giveaway contest. Also, I am an affiliate for Amazon, and if you click through the linked titles or ads and make a purchase, I will receive a small commission at no extra charge to you. Proceeds will be used to maintain this self-hosted blog. The Draconid Meteor shower is due Saturday October 8, 2011, right in time for World Space Week. In addition, Saturday is also International Observe the Moon Night. Sounds like perfect reasons to go take a look outside at night. This video from NASA (has an ad) will explain more. If you miss the Draconid shower or it doesn't turn out to be much of a show, try the Orionid meteor shower which is supposed to peak in the early morning of October 20 and 21, 2011. Unfortunately, the brightness of the moon may interfere. Leave us a comment and let us know what you see.